We have reported on a variety of USB related devices in the past, but I will have to admit that we have ignored the needs of the ladies. So, in order to show that equality amongst genders is still alive, I would like to proudly display the USB Gift Set For Ladies. As you can see, the USB Gift Set For Ladies is made with plenty of pink accessories. For example, it includes a Mini Vacuum Cleaner, a USB fan, a USB lighted mirror, and a USB Mood Light Pen Holder. 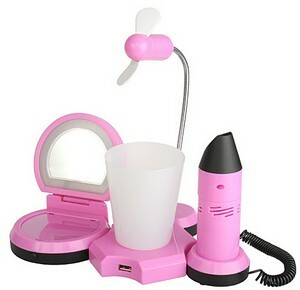 I realize this may sound anti-feminist, I suppose that the USB lighted mirror is for checking the makeup. I suppose the fan is for keeping it cool, and the vacuum is for tiny dusty messes. I suppose that Barbie or Elle Woods from Legally Blonde would feel very comfortable with these USB accessories. I couldn’t help but wonder what the USB Gift Set For Men would look like. Perhaps it would have an electric shaver, an electronic buffer for the car or gun, and they would hopefully keep the vacuum. (Men are messy!) Perhaps it would look better in black than hot pink. If you want to have the USB Gift Set for Ladies, feel free to shell out $29.50 on the Brando site.